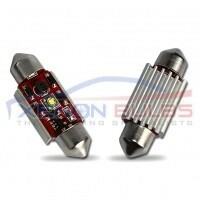 39MM LED Festoon Bulbs 3 SMD CANBUS ERROR FREE..
CANBUS FESTOON LED BULBS 39MM 3 SMD- (Pair) This model of CANBUS 39MM Festoon High Power LED bulb..
39MM LED Festoon Bulbs 6 SMD CANBUS ERROR FREE.. 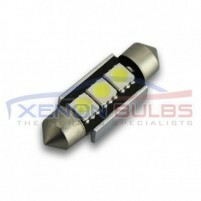 This model of CANBUS 36MM Festoon High Power LED bulbs has a total of 6 SMD LEDs built into each bul..
5 SMD T10/501/W5W LED BULBS - PAIR canbus Number plate..
BMW 18 SMD NUMBER PLATE LIGHT UNIT E90 92 93 E70 E71 E60 61 E82 88..
24 SMD LED Number plate units are a direct replacement for your standard. 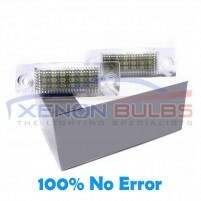 Rather than swapping the b..
VW Caddy Touran Number Plate LED Unit Canbus Error Free.. These LED units have been specially designed to replace OEM license number plate lamps Ours our u..
VW GOLF MARK 4/5/6/7 18 SMD NUMBER PLATE LIGHT UNIT.. 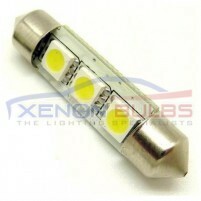 These LED units have been specially designed to replace OEM license number plate lamps They have ..